Every person in America can sell everything they own two times — every house, car, bicycle, tent, stock, bond, blanket and kitchen sink — send all the money to the federal government, and Medicare and social security will almost be in good standing. Americans have $90 trillion of personal wealth and $210 trillion of federal debt.1 We are a dead man. We rest peacefully, in a lead coffin, at the bottom of the sea. We are underwater and we can’t pay our bills. We are dead broke. Plan B is now our destiny. The federal government’s debt of $210 trillion is two times greater than all of the personal wealth of all Americans combined. The federal government’s debt is 11 times greater than the debt of a country in bankruptcy. And the federal government’s debt is more than 20 times greater than the mortgage debt on every American home. (Please see the chart “America the Beautiful Bankrupt. The Progressive Democratic Party Led by Big Media Has Bankrupted the United States”.) The Democratic Party, led by the progressive Big Media, whose signature legislation is social security and Medicare, has bankrupted the wealthiest country in the history of the world. The “social justice” initiatives of President Roosevelt and Johnson will end with the greatest financial crisis ever. The Roosevelt-Johnson global depression will spread poverty misery and violence far and wide. Socialism bankrupts host countries. America is going to learn the hard way and the world will be forced to go with us for a very long ride. Big Media will bury the story until the cities are burning. The community organizers promising social justice have purchased America’s bankruptcy. The progressive arc of history leads to destitution. All Americans are poor. If this seems impossible, then you may find plausible that the people who run Washington D.C. have been spending other people’s money and, much better for them, cooking the books in an iron-melting furnace. The face value of our current federal debt is over $19 trillion. That money we borrowed to pay our bills. Borrowing to pay bills isn’t the only way to incur debt. You can make a promise to pay somebody in the future, fail to set aside the money to make the payments, and call the money you didn’t set aside an “unfunded liability”. It’s easy to hide the debt with the label “unfunded liability” because you don’t call it a debt. You call it an unfunded liability. We have done this with great ambition through Social Security and Medicare. It’s a financial fraud. And everybody is going to pay. The numbers are gargantuan and do not require imagination to predict insolvency. A nation can be considered to be at bankruptcy’s door when federal debt equals Gross National Product or $18.2 trillion in 2015. We are 11 times beyond that bankruptcy borderline at $210 trillion of debt. Greece is a savvy tycoon sitting on piles of money compared to the United States. Detroit is a model of careful planning. Venezuela is smooth and efficient in its operation. What is your hardest bill to pay? Your mortgage. What is the total of all American home mortgages? $10 trillion. We had trouble in 2008 paying back $10 trillion of mortgage debt. Do you remember that crisis? What kind of crisis should we expect for a $210 trillion debt? We should expect 20 times worse. Get your bomb shelter stocked up. Get your passport updated. The progressives and the Democratic Party have bankrupted the United States. The game is over. If a typical American family buys a $100,000 house and pays off the mortgage they have $100,000 of wealth. If you add up the wealth of all Americans it is equal to $90 trillion dollars. If you add up all the money the federal government should have in the bank to pay for social security and Medicare it is equal to $210 trillion dollars. The current typical debt of an American family is about $125,000. If our federal government debt for future obligations is spread out evenly to each American family, they would each owe $1.8 million to the federal government; including 23 million families who live on food stamps. If you are currently having problems keeping up with your debts, imagine what would happen if they were multiplied 15 times? If you find it easy to imagine that you would be bankrupt, then you know that the United States is bankrupt. A better way to see the numbers. 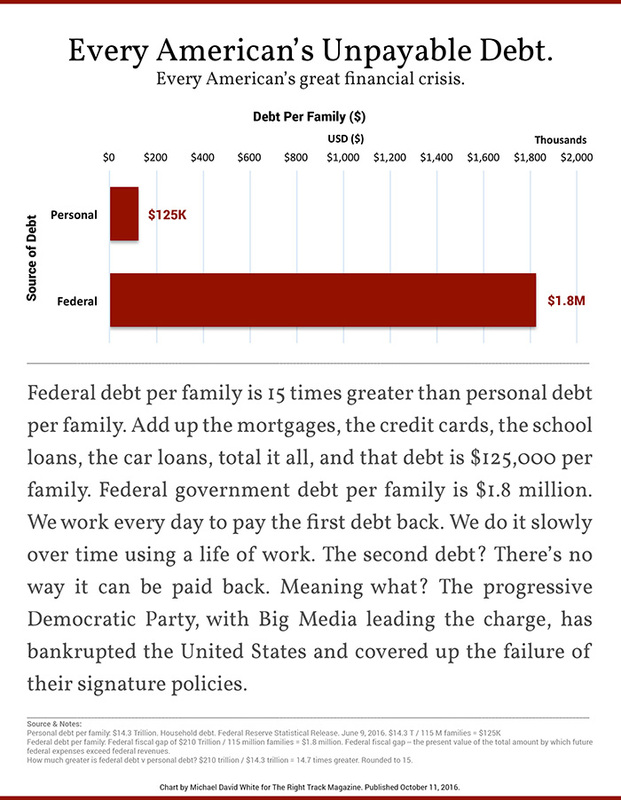 You are a typical American family with $125,000 of debt. Estimate you pay $1,000 a month on that debt. Now, in our hypothetical example, you are required to pay your fair share of the federal debt every month. Your monthly payment for the federal government debt is $15,000. You need to take home $16,000 every month to break even on your debts — personal and federal. Don’t laugh. This is our life. This is the life we are giving to your children. This is the life we have given ourselves. Our country is bankrupt and there will be hell to pay. If you want to look around and give thanks for this gift, talk to the progressives. They are the geniuses who fundamentally transformed the greatest capitalist power, the wealthiest nation in the history of the world, into a bankrupt socialist state. Give a warm “hello” to our community organizers. The default on our federal debt will be a great explosion heard around the world; not a shot heard around the world to lead all to freedom, but an explosion to proclaim insolvency. It will be the most important macro-economic event of every person in every country alive at that time. To be topped in the 21st Century only by world wars, catastrophic meteor collisions, or some other world-ending event. The Progressives’ creation of America’s bankruptcy, with their perfect incompetence in designing social security and Medicare, will unleash the most powerful global initiative ever seen to increase poverty, misery, food riots, burning cities, starvation, crime, political imprisonment, murder, dictatorship. If you are dedicated to “social justice” and the progressive dream, this is the joy you bring to the world. These are the means you use to create equality. The ends you bring are misery, poverty and death. The epic failure of progressive policy proves Democrats are deep-off-label sociopaths. The Republicans are crawling demigods of appeasement. And the media? The media are an asphyxiating radiation of satanic mendacity. Psychos cowards and frauds rule the world. Just like the bible says. If Big Media can cover up the bankruptcy of the United States, could they frame an innocent for the assassination of a president? Dallas Killed Kennedy. Progressives Killed Journalism.